A quick post to enter one last challenge before I start cooking and entertaining tomorrow. Wicked Wednesday has given me a chance to use a couple of the stamps I got from Scrolls Works before they went out of business. 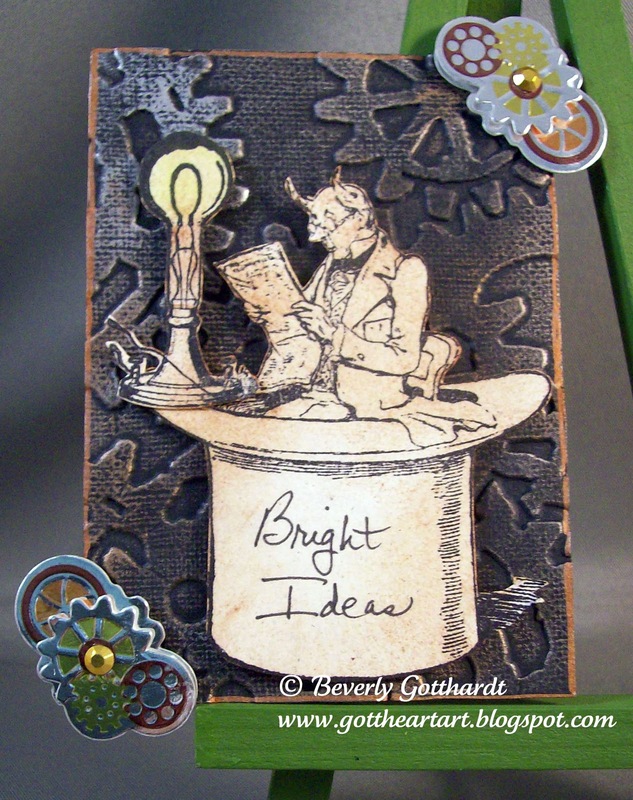 I'm a big Steampunk fan, so with an embossing folder, some Metallic Rub-On, and gear embellies from Jolee's Boutique, we've got some Bright Ideas turning in this gentleman's mind. I really like the background and the way it contrasts with your stamped image to bring it out. The sentiment is pure perfection :) thanks for joining us over at Wicked Wednesdays! This is really clever Beverly!! Made me smile!!! Thanks again for supporting us at Wicked Wednesday & joining the challenge this week!!! I always love your creations!! !